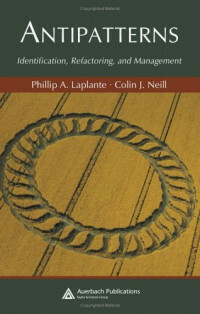 AntiPatterns: Identification, Refactoring, and Management catalogs 48 bad management practices and environments common to software development, IT, and other organizations. The authors cover antipatterns of management, along with environmental/cultural antipatterns and personality antipatterns/phenotypes. Through the classification of these harmful practices, you will be able to identify problems in your own work environment, and take action to correct them. Following introductory material describing management theory and how humans behave individually and in groups, the text provides the catalog of management and environmental antipatterns. The book then offers general advice on overcoming bad practices through successful interaction with clients, customers, peers, supervisors, and subordinates. In troubled organizations, a frequent obstacle to success is accurate problem identification. When problems are incorrectly diagnosed by management or by the consultants they hire, then correction of the problem is rarely possible. Conversely, when problems are correctly identified, they can almost always be dealt with appropriately. Unfortunately, organizational inertia frequently clouds the situation or makes it easier to do the wrong thing rather than the right thing. So how can one know what the right thing is if one has the problem wrong? This is where antipatterns can be helpful. Shortly after the emergence of patterns, practitioners began discussing problem-solution pairs in which the conventional solution does more harm than good, known as “antipatterns.” In their groundbreaking work, Anti-Patterns, Brown, Malveaux, McCormick, and Mowbray described a taxonomy of problems that can occur in software engineering. They also described solutions or refactorings for these situations. The benefit of providing such a taxonomy is that it assists in the rapid and corr ect identification of problem situations, provides a playbook for addressing the problems, and provides some relief to the participants who can take consolation in the fact that they are not alone. Want to master Nmap and its scripting engine? Then this book is for you – packed with practical tasks and precise instructions, it's a comprehensive guide to penetration testing and network monitoring. Security in depth.